18/3/13 - Restoration - Paris, Church of Notre Dame de Lorette - We had been planning to write an article about the church of Notre Dame de Lorette for several months now as part of the series of Parisian churches which are under serious threat. In fact, we will now highlight it to speak of a restoration which is currently underway. The church is far from being entirely saved but at least we are pleased about this work concerning the decor of the apse which should end in June. Built between 1824 and 1836 by Hippolyte Lebas, this church is no doubt one of the most important and most beautiful constructed during the Restoration and the Monarchie de Juillet in Paris. Its interior decor reflects the variety of Parisian painting under King Louis-Philippe, with works by artists of very different styles. The restoration which is being carried out concerns the paintings on the vault (cul-du-four), by François-Edouard Picot (ill. 1 to 3). We had already gone up the scaffoldings set up in 2009 to look at the preparatory study and see the state of deterioration but also their remarkable quality, as well as the painting on the cupola produced by Pierre-Claude-François Delorme (ill. 4 and 5). According to the restorers, a group led by Alix Laveau, the rather extensive gaps, notably at the edges, are very old, while two documented restorations had already taken place, in 1929 and in the 1970’s. The paintings had become very black due to the gas lighting and the partial cleaning shows that they will be beautifully transformed once the work is finished. 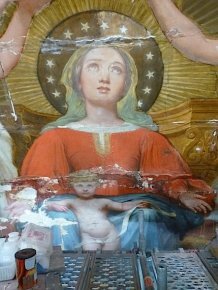 The restoration showed early on that Picot, under Italian influence though working with oil, tried to achieve a fresco effect. The purely decorative part, rounding out the apse under the cul-du-four, will also be restored (this will consist essentially in a simple cleaning as the condition is acceptable) and the project should be finished in June as mentioned above. The challenge will then be to take care of the rest of the church before the damages, already very important, become irreparable but for the moment, there are still no plans to begin. The corner pieces on the Delorme cupola, representing the Evangelists, are extremely deteriorated ; one of them is even mostly destroyed (ill. 6). Other urgent points : the mural paintings in the four corner chapels, painted respectively by Victor Orsel (to the left of the choir), Alphonse Périn (to the right of the choir), Adolphe Roger (to the right of the entrance) and Merry-Joseph Blondel (to the left of the entrance). The last one (ill. 7), now propped up, is so covered in soot (apparently due to a fire) that is almost invisible, while those by Roger (ill. 8) and d’Orsel are covered with adhesive paper so as to prevent the paint from falling ; the condition of the Périn chapel is just as unsatisfactory (especially since the entire base was scraped away and repainted with unacceptable "restorations" in the 70’s). The budget for the project (without the scaffoldings) in the apse is of 55,000€, a rather reasonable amount, given the work entailed. Of this, 33% is funded by the French Ministry of Culture, via the DRAC (the paintings are listed as historical monuments). In comparison, we might recall that the cost to the city of Paris for the disgusting canopy going up at the Halles is over 260 million euros if we are to believe the figures (no doubt underestimated) announced by Anne Hidalgo herself.